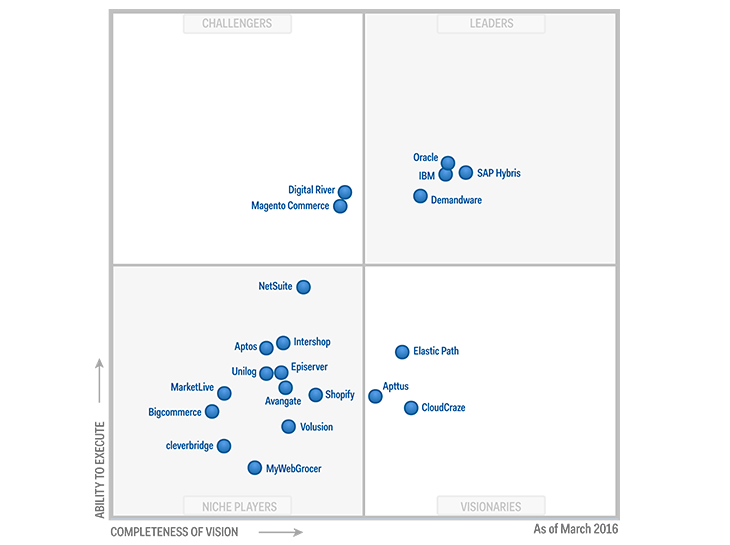 In 2016, Gartner produced their Magic Quadrant review of leading e-Commerce platforms. Systems that cost a few thousand for small merchants, to 7-figure sites for the world's leading brands selling $100M online. This is a detailed report on the history of each company and identifies the key strengths and weaknesses of each. Here are the highlights below for BigCommerce & Magento. Contact us for the full report! Magento Commerce is a Challenger with Magento Community & Enterprise Edition. This is an open-core B2B and B2C commerce solution, ideally suited to midsize and large companies that are looking for a cost-competitive solution and prepared to add functionality through prebuilt extensions from Magento's partner and developer ecosystem or via internal, PHP-based development with the help of a Magento Solution Partner. Magento Commerce was spun off by eBay as an independent company in 2015. It has headquarters in Campbell, California, U.S., and offices in Europe and the U.S.
· New company focus: Magento was spun out of eBay, purchased by a private equity firm, Permira, in November 2015, and then launched as an independent company called Magento Commerce. Working as an independent company should enable it to focus on its core set of products and partner ecosystem. One indication of this is that the long-awaited Magento 2.0 product was launched in November 2015, along with the announced certification of over 200 extensions and partner applications for this product. · Cost-effectiveness: Magento Enterprise Edition offers a cost-effective alternative for companies trying to achieve a lower TCO for their digital commerce efforts. Magento is often used by SMBs, midmarket commerce firms and companies prepared to integrate the Magento platform with plug-in apps for incremental functionality. Reference customers believe that Magento provides a strong value proposition and expressed overall satisfaction with its commerce platform. · Broad partner ecosystem: Magento has more than 70,000 developers globally, and over the past two years it has made advances in certifying its implementation partner network, which previously suffered from an inconsistent level of experience, training or quality. The company has also worked with its implementation and extension developer partners to ensure certification and readiness for its latest release, Magento 2.0. · Platform transitions: In its announcement of Magento 2.0, Magento added that it will support Magento Enterprise Edition 1.13 and 1.14 until November 2018, meaning that there is no immediate urgency for existing customers to upgrade. However, merchants should start the process of evaluating the upgrade effort and putting in place a project plan and budget for upgrading. · Upgraded extension requirements: Most Magento implementations are heavily reliant on extensions from third-party developers: the average customer uses 10 to 20 extensions, and a total of approximately 8,400 extensions are in the Magento marketplace. Customers upgrading to Magento 2.0 should evaluate their current and projected extension requirements with the certification plans of Magento and its partners. They should also note that Magento now enforces a review process with developers in an effort to increase quality and reduce extension duplicates. · Advanced B2B and B2C functionality limitations: Although a native B2B add-on module for Magento 2.0 is planned for 2Q16, customers must currently use extensions or custom development for several B2B capabilities, such as approval workflows, automated reordering, CPQ and contract pricing. Some multichannel enablement functions, such as "buy online, pick up in store" and "buy online, return in store," require the preintegrated Magento Commerce Order Management and Magento Retail Associate Platform. Magento's native WCM functionality is not competitive with that of best-of-breed products, and many customers use third-party DOM/OM functionality. Bigcommerce is a Niche Player. It offers a multitenant SaaS digital commerce platform that is used primarily by small and midsize businesses (SMBs) with less than $20 million in GMV. It has headquarters in Austin, Texas, U.S., and sales or development offices in the U.S. and Australia. It has approximately 370 employees and 95,000 online stores. In May 2015, it launched Bigcommerce Enterprise for high-volume retailers. Bigcommerce has received $125.2 million of funding from six investors. · Low cost of entry: Bigcommerce offers cost and functionality appropriate for SMBs and brands generating less than $20 million in GMV. Bigcommerce has three published pricing plans with no revenue sharing or transaction fees. Publicly available case studies and communities indicate that the platform is easy to set up, use and feature-appropriate for its target market. · Brand and partners: Bigcommerce has become a well-known brand among retail SMBs, and it has a growing customer base. It is improving its customer experience, UI and storefront, and expanding its integration with back end systems through proprietary feature launches, partnerships and acquisitions. These include the acquisition of Zing (for inventory management); integration with Square (for POS capabilities) and ShipperHQ (for shipping-rate management); and partnerships with WebShopApps (for shipping-rate capabilities), Twitter (a "buy" button), Alibaba (for wholesale sourcing), Intuit (for QuickBooks Online) and Xero (for an accounting system). Bigcommerce's Stencil developer framework, launched in November 2015, enables developers to create, test and launch custom sites; it is currently used by several agencies, including ECommerce Partners, Groove, Interstellar and Pixel Union. · Management team expansion: Bigcommerce has strengthened its executive team with professionals from the digital commerce industry. Recent management hires include executives from Amazon, Google, PayPal and Twitter. · Focus on retail SMBs and B2C: Bigcommerce focuses on retail SMBs, with most of its customers selling only online, although about one-third of its customers also have a physical store. The most popular Bigcommerce product package is aimed at businesses with up to $125,000 in online sales volume per year. · Limited product functionality: Although Bigcommerce provides an easy, low-cost entry point for retailers, its product functionality may be lacking for companies with more complex digital commerce requirements, such as for highly customizable online store themes, responsive design, multistore sites with centralized product catalog management, and advanced B2B functions. · Competitive viability: Bigcommerce faces competition from several companies focused on the SMB segments of the retail and B2C markets.